Paw paw’s 88th birthday was coming up, and we promised to bring a dessert. But this was a tough week and time got away from me. I needed to reach back into my quick cook inventory. A quick scan of the shelves told me we had apples, caramel sauce and some pecans in the freezer. I’m going to teach you my super quick, go to master fruit pie recipe. You can use this master recipe to create just about any fruit pie you like. 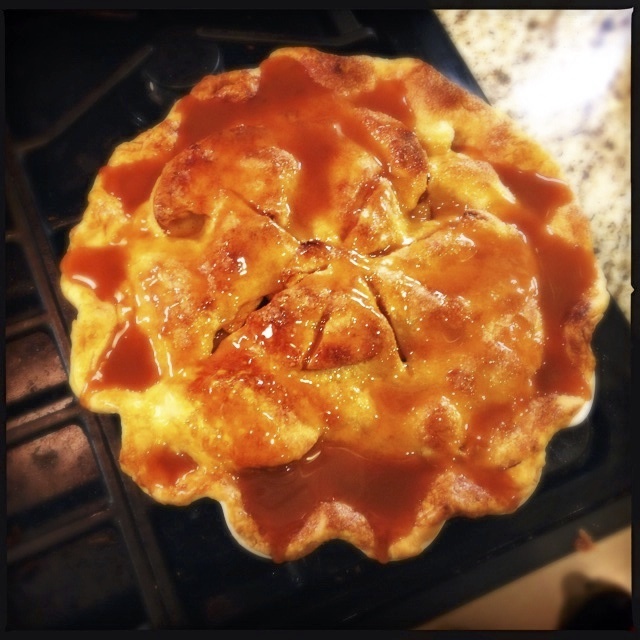 This week, I’m turning the master pie recipe into a quick and easy Cinnamon Apple Pie with a Caramel Pecan Topping. 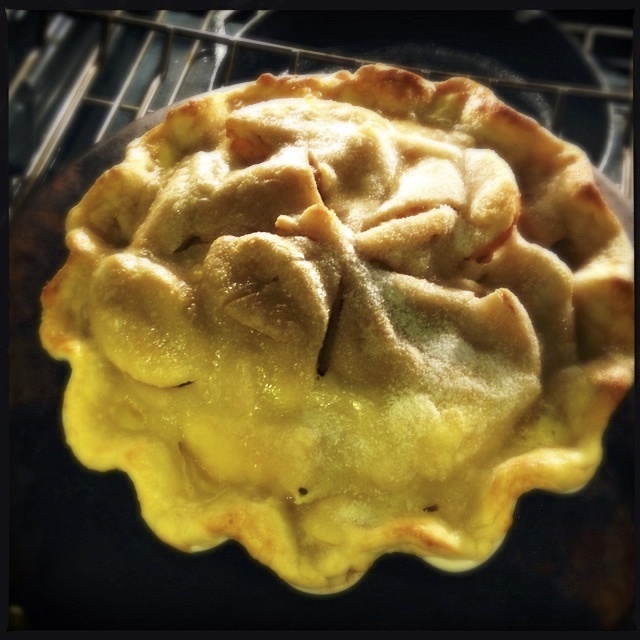 Pies are basically composed of two parts: crust and pie. 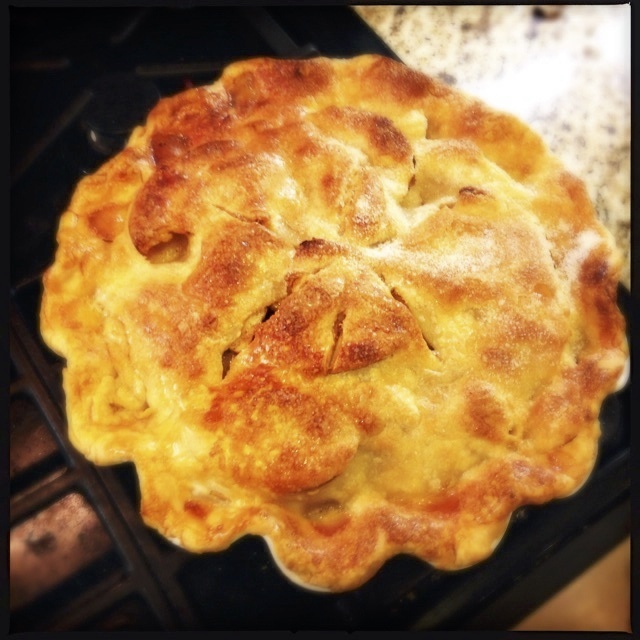 I make pies often, and like to make my own crust. 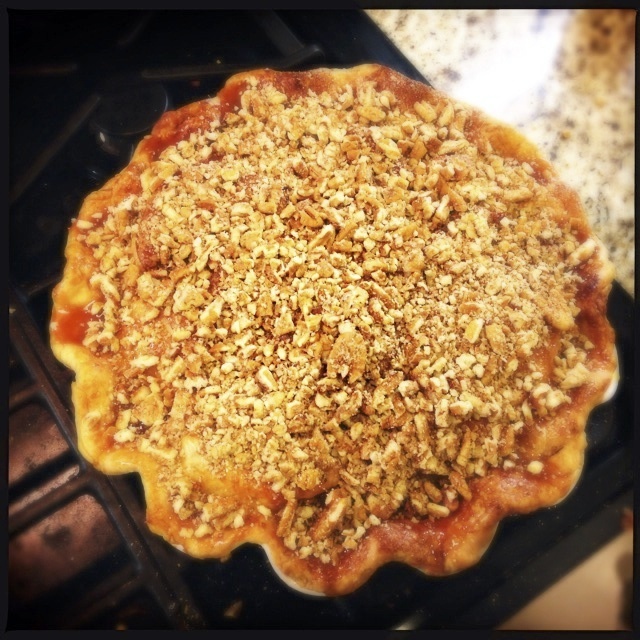 However, to speed up time, we are going to use store-bought pie crust. Trust me, we’ll dress it up. Anyway, you’ll want two crusts. That’s one package. Adjust your oven’s shelves so that you have an available oven rack in the center of your oven, then preheat your oven to 425 degrees. Open up the store-bought pie crust package and unroll the two crusts. 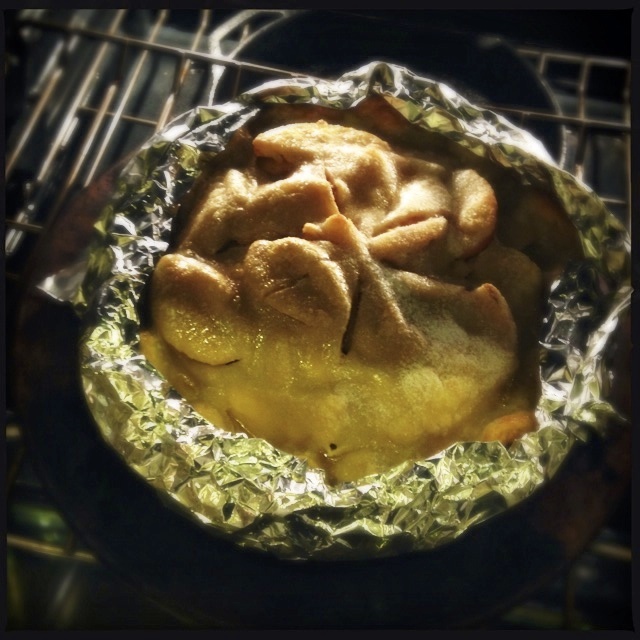 Place one crust inside your pie tin, and gently press it down. Don’t get the crust too thin when you press it down. Put the pie tin into your refrigerator to cool, and place the other unrolled pie crust into your refrigerator, keeping it flat. Now it’s time for fruit. This is where things get fun. The filling will take from 4 to 6 cups of fruit (measure your 4 to 6 cups after you have cut the fruit). You’ll want to chop up your fruit into appropriate “pie-sized” pieces: the general idea is to cut it in the shape you want to see or eat. For apples or pears or plums, you want long, half moon shaped pieces. For strawberries, do it like your grandma did—either long slices, or cross slices, or even half strawberries. If you’re using berries, you’ll want to keep them whole. Once you have the fruit cut up, put it in a large bowl, then taste the fruit. How sweet is it? Is it tart? Do you want the final pie to be sweet, or tart? Adjust that with up to ½ cup of white or brown sugar, or with the juice of up to ½ of a lemon (add them to the bowl and mix it up well with the fruit). Remember that you don’t have to add either of them. You might want to add both of them (say, if you are using tart cherries in water, and want to sweeten them up and brighten up their flavor). It’s up to you. If you do use lemon juice, you should also zest the peel of your lemon half into the fruit. I use a microplane grater because it only pulls off the very outer layer of the lemon, where all the goodness lives. Now it’s time for spice. You want to add something that will jazz up the flavor. 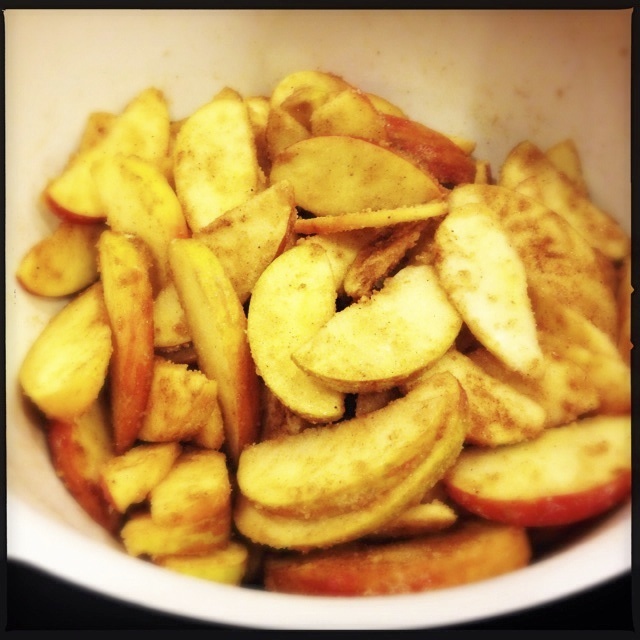 With apples, I like 1 teaspoon cinnamon and ¼ teaspoon allspice. Top it with chunks of butter, using about ½ stick of butter. Then add the top crust. Time to crimp the edges together. I use the thumb and two fingers on my right hand and grab the edge of the top crust with the pad of my thumb, and the bottom crust with the pads of my first two fingers, and press them together. Then just circle the pie. Once the top crust is on, you need to vent the steam that will be created while it cooks. 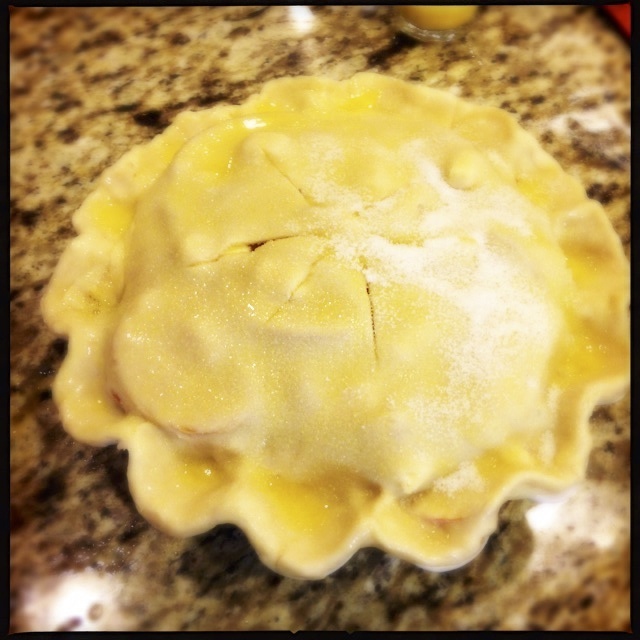 Make a few slits from the center of the pie towards the edges, say 3 to 5 slits about two inches each. Pop it into the oven and do the first half of the bake at 425 degrees for thirty minutes. After 30 minutes, add the foil edge protectors. Turn the oven down to 350 degrees and bake it for 25-30 minutes more. Pull it out when it is nicely golden brown. When you pull it out of the oven, let it cool for about 30 minutes. Then top it with about 1 cup of chopped pecans. No one will ever believe that you threw this together in about 20 minutes of work. Heck, the oven did more work than you! Open up the store-bought pie crust package and unroll the two crusts. 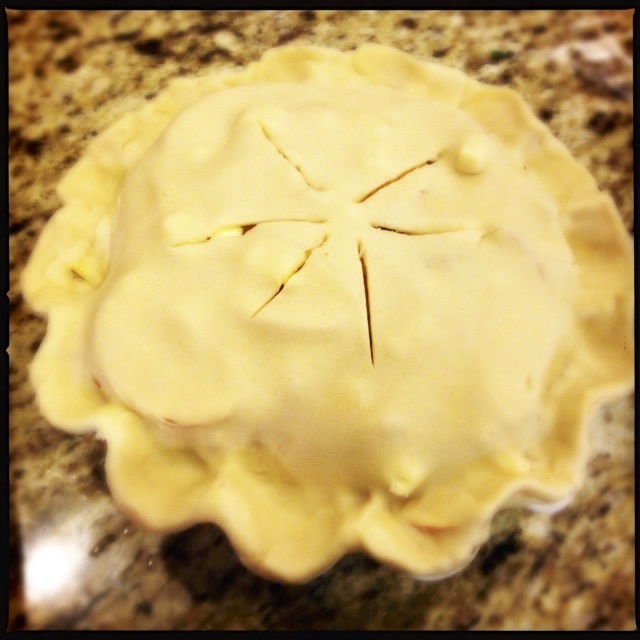 Place one crust inside your pie tin, and gently press it down. Don’t get the crust too thin when you press it down. Put the pie tin into your refrigerator to cool, and place the other unrolled pie crust in your refrigerator, keeping it flat. Now it’s time for fruit. The filling will take from 4 to 6 cups of fruit (measure your 4 to 6 cups after you have cut the fruit). Chop up your fruit into appropriate “pie-sized” pieces: the general idea is to cut it in the shape you want to see or eat. For apples or pears or plums, you want long, half-moon shaped pieces. For strawberries, do it like your grandma did—either long slices, or cross slices, or even half strawberries. If you're using berries, you’ll want to keep them whole. Once you have the fruit cut up, put it in a large bowl, then taste the fruit. How sweet is it? Is it tart? Do you want the final pie to be sweet, or tart? Adjust that with up to ½ cup of white or brown sugar, or with the juice of up to ½ of a lemon (add them to the bowl and mix it up well with the fruit). Remember that you don’t have to add either of them. Or you might want to add both of them (say, if you are using tart cherries in water, and want to sweeten them up and brighten up their flavor). It’s up to you. If you do use lemon juice, you should also zest the peel of your lemon half into the fruit. I use a microplane grater because it only pulls off the very outer layer of the lemon, where all the goodness lives. Now it’s time for spice. You want to add something that will jazz up the flavor. 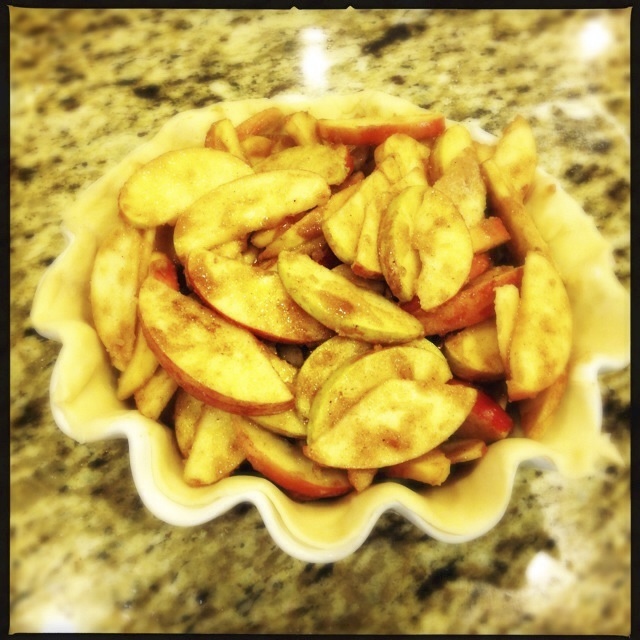 With apples, I like 1 teaspoon cinnamon and ¼ teaspoon allspice. Once you have the fruit ready, it’s time to build your pie. 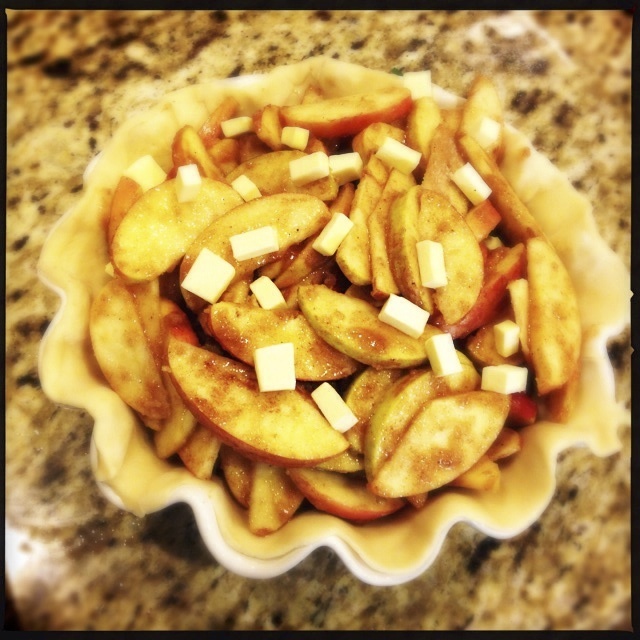 Take your chilled pie crust from the refrigerator. Add your fruit, and try not to add much of the juice from the bowl. That will make it soggy once it cooks (the fruit will break down under the heat). Top it with the chunks of butter. Time to crimp the edges together. I use the thumb and two fingers on my right hand and grab the edge of the top crust with the pad of my thumb, and the bottom crust with the pads of my first two fingers, and press them together. Then just circle the pie. Add about ¾ cup of jarred caramel sauce. 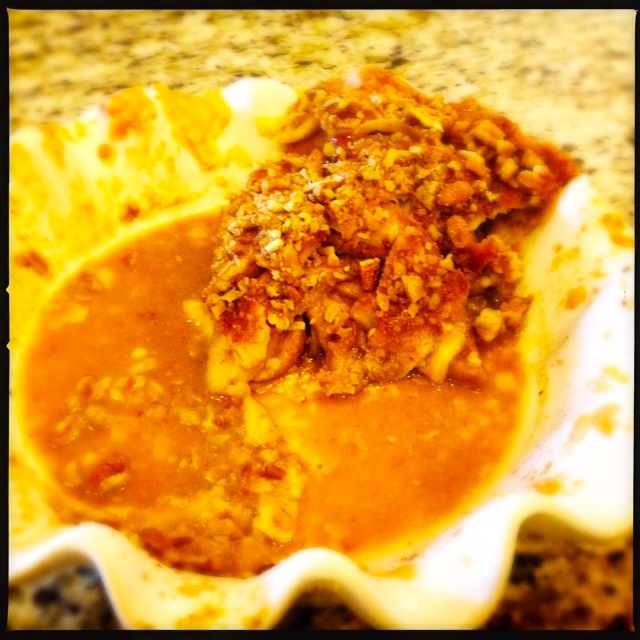 Top it with about 1 cup of chopped pecans. I was worried about spammers, but I’ll put it up on my “About Me” page! Thanks!